After a rare 3:45 wake up call by Liam, who woke up and wanted to play, I put him in bed with me so he would fall back asleep. Nothing like mommy holding him tight so he can't flit around. After smacking me around for a while he finally fell asleep about 2 hours later. 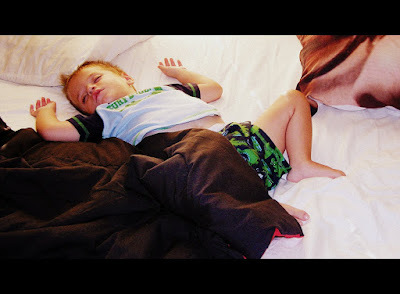 When I finally woke up, I found him sprawled across my bed, in the center, sound asleep. And I took this picture after trying to wake him up.